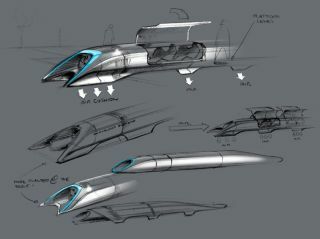 Elon Musk, of SpaceX and Tesla Motors, revealed his futuristic "Hyperloop" transportation system on August 12, 2013. A year after first teasing the public about his "Hyperloop" travel concept, billionaire entrepreneur Elon Musk has finally revealed details about the potentially revolutionary transportation system of tomorrow. Musk unveiled his vision for the Hyperloop transportation system online today (Aug. 12), saying that it could rocket passenger-packed pods through long tubes at 760 mph or so (1,220 km/h) using energy derived from the sun. The technology could cut the Los Angeles-San Francisco travel time to 30 minutes and would be ideal for such medium-distance jaunts, said Musk, who heads the private spaceflight company SpaceX and the electric-car firm Tesla. The Hyperloop would accelerate pods — each about 6.5 feet (2 meters) wide — through a low-pressure tube from Point A to Point B. These pods would ride not on rails or wheels but rather a cushion of air, greatly reducing the friction of the system. "It would actually be a lot like traveling in an airplane," Elon Musk told reporters during a conference call today. "There'd be initial acceleration, and once you're traveling at speed, you wouldn't really notice the speed at all." Hyperloop passenger capsule version with doors open at the station. The pods would be revved up to near-supersonic speeds by linear electric motors like those used by Tesla. But the ultimate source of energy for the system would be the sun. "There's actually way more surface area on the top of the tube [for solar panels] than you really need," Musk said. Musk envisions the Hyperloop as an alternative to California's proposed $70 billion high-speed rail system, which he regards as too expensive, inefficient and slow. He thinks a Los Angeles-San Francisco Hyperloop line could be built for about $6 billion and deliver a much better travel experience to passengers. Tickets would be much cheaper than seats aboard a train or airplane, for example, and crashes would be extremely rare. "It's not like it's going to fall out of the sky, nor can it be really derailed, as a train can," Musk said. The bulk of Hyperloop's cost would come from building the tube, which in California would primarily parallel Interstate 5 through farm country. Because the pods are designed to be light, the tube would be mounted above ground on pylons, reducing construction costs, improving earthquake safety and easing right-of-way issues, Musk said. I-5 Section of proposed Hyperloop route. The preliminary route is shown in yellow. Bend radii are shown in red. Musk released his "alpha design" today in the hopes that the global community of inventors and engineers can tinker with and improve it. If somebody with the means and the talent took the idea and ran with it, he said, the Hyperloop could be carrying passengers between Los Angeles and San Francisco in as little as seven to 10 years. Musk said last week that he likely won't be able to devote much time to the Hyperloop in the near future, since running Tesla and SpaceX is so demanding. But today he said he's interested in building a subscale demonstration model of the technology to help get it off the ground. That would likely involve the creation of yet another company, he added. "If somebody else goes and does a demo, that would be really awesome, and I hope somebody does," he said. "But if it doesn't look like that's happening, or it's maybe not happening in quite the right way, then that's when I might allocate some time to this." "I'd like to see something like this happen," Musk added. "I don't really care much one way or the other if I have any economic outcome here. But it would be cool to see a new form of transport happen."